Gary was volunteering at Atria, a national assisted living facility, helping a friend each Friday and during the holidays, including the high holy days of Passover. It become his weekly routine and Gary’s kindness and generous spirit did not go unnoticed. When a dishwasher position became available, he asked his employment specialist at ICANFL if she could help him get the job. ICANFL worked with Gary and helped him get the job with the company. He was able to tough it out the first few months when he was asked to work longer hours and now has been with the company for over six months. Always cheerful and helpful, Gary would oftentimes socialize with the residents when his shift was over. In the future, Gary wants to move from Florida, but wishes to stay with the company. We are so proud of Gary. Chris has been a long time employee of Publix. He was only receiving 4-6 hours per week when his family reached out to ICAN. After talking with his supervisors and observing Chris’ work ethic, ICAN was able to work with Chris on some things he had difficulty with. Now Chris is able to work more hours during the day and more days throughout the week. “This is truly a passion of mine, my calling. I feel proud that I can make a difference in people’s lives,” says Debbie Tesley, employment specialist for ICAN Living and Learning. Ladarius has been Debbie’s client for many years and Debbie has developed a special commitment to his success. 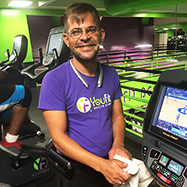 Ladarius is now working as a janitor for YouFit close to his home. His boss is so impressed with his positive attitude and great work ethic. Ladarius is loving his new job, and the people he is working with. Everyone at ICAN is excited for Ladarius to begin his future working at YouFit and looking forward to seeing him grow and build a solid career with YouFit. ICAN Living and Learning is focused on helping others, providing opportunities for individuals who need special care to secure employment. Such is the case for Darryn. Darryn’s dream was to work as a package handler. Employment specialist Debbie worked with Darryn, immediately contacting freight companies in his area. She was able to secure a job interview with FedEx when an opportunity opened up. Debbie advised Darryn on the interview and how best to prepare for the meeting. Guess what? Darryn went to the interview and FedEx gave him the job! After the meeting, Darryn was so ecstatic and called Debbie thanking her and giving her the great news. He only wished that he worked with her earlier so she could have gotten the job sooner. Sometimes, it is just a matter of timing and finding the right person to get you that chance. Now, Darryn is starting his new career and looking forward to what else life brings him. Porsha was born with hydrocephalus, commonly known as, “Water on the Brain.” Porsha would share this information but not use it as an excuse for anything. Porsha talked about her strong faith and this is what helped Porsha cope with her challenging condition. At first meeting Porsha was shy but determined. Porsha was thin and would share that she was very hungry. Her home was full of brothers and sisters and her mother. Money was not abundant. Porsha would sometimes nod off in the car; hungry and tired. McDonald’s restaurant, newly renovated, was within walking distance of where Porsha lived. Porsha would frequent McDonalds in search of a job. Finally her determination paid off! Porsha was hired! Thankfully now, Porsha has put on some much needed weight because she can now afford to eat. Porsha now has dreams that extend past McDonalds. “I want to be a nurse or a teacher.” I would not bet against her; Porsha has the ambition to do what she sets her mind to do and her physical challenges will not get in her way. Porsha often asked about other clients and when she found out they were looking for work she would share, “They will get a job, don’t let them get discouraged.” Porsha is a bright light and she will change the world she touches with her, “Can do” attitude. ICAN Living and Learning is dedicated to making people feel useful and are able to contribute to their community. Sometimes it means having patience to connect job seekers and companies to get a perfect fit. 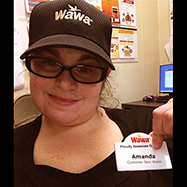 Amanda, a charming, friendly and resilient person, communicates using sign language and her manager at her previous company was not able to communicate with her. Amanda, frustrated with the job search process, met with ICAN to be evaluated of her capabilities and skills. ICAN gave Amanda a new beginning, matching her with a perfect job with a convenience store in Lake Worth, FL. She is cleaning the store, refilling coffee and other beverages and is learning how to prepare sandwiches for customers. Amanda is very happy and appreciative of her job coach at ICAN. Cheryl is an epitome of how ICAN Living and Learning Center can help a person that just needs a break. Cheryl has been dealing with constant illnesses and numerous job cuts which resulted in her losing her home. Despite it all, Cheryl has kept her dignity, determination, strength and hope. ICAN’s was able to work with Cheryl and give her much needed help to get back on her feet now working at a fast food chain. Her immediate goal is to work full time and rent her own place. Cheryl continues to wear a bright and vivid smile on her face. She is appreciative for the support and assistance when she needed it most from ICAN Living and Learning Center. Maurice is blessed to be alive today after a major accident caused a traumatic brain injury that many people would not have survived, let alone be smiling years later. Approximately fifteen years ago, Maurice was driving his scooter home from work when he hit a curb and crashed, sending Maurice airborne. The injury that Maurice sustained left him in a coma for two weeks and Maurice ended up not working for almost five years. The brain injury left him with short term memory loss, making it difficult to find consistent work, and creating a major obstacle when working at jobs that requiring Maurice to remember things. After being introduced to ICAN Living and Learning, his coach reviewed Maurice’s case and decided that the best job would be one that the same tasks would be repeated each day that he could accomplish and not overstress his memory. ICAN had Maurice interview at a fitness center as a maintenance worker and it was a great fit. Ever the determined worker, Maurice says that, “If you are on time at work, you are late!” Maurice arrives each day early on his bike, ready to go and gets co-workers and gym patrons pumped to start the day. “The reason I am a success at this job is the people, I like the people,” Maurice says. Maurice’s easy going attitude, broad smile, and work ethic makes him an asset to the fitness center. He is truly a joy to be around. Sometimes, something great comes from doing what you love to do most. Santiago is 23 year old and graduated from Glades High School in Coral Springs, FL. He was working as a busboy at a local restaurant when he contacted ICAN Living and Learning Center with the dream of finding a rewarding career. Santiago has always had a love of animals and was walking dogs around his neighborhood for some extra money. 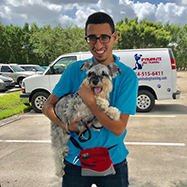 Seeing his passion and how he handled animals, ICAN connected Santiago with a local dog training business to gain experience and harness his talents working with dogs. ICAN paid for his on the job training and within a short time, ICAN was able to secure a position for Santiago with the company working 30 hours a week. His hard work and dedication paid off. Santiago not only has a great opportunity to grow and prosper in a job that is fulfilling; he also is doing something he loves, helping his furry friends. Alliah came to ICAN Living and Learning Center with the dream of finding a career and working with a stable company. At that time, she was living in a hotel room with little prospects to change her situation. ICAN worked closely with Alliah, helping her with searching for the right job that fit her skills and many talents. In a short amount of time, ICAN was able to find her a job at Sky Chef, one of the largest providers of airline catering and in-flight services, based in Fort Lauderdale, Florida. At Sky Chef, Alliah assembles food trays for the airlines. Alliah’s dynamic personality, infectious smile and can-do attitude connects with people and recently. Her manager is ecstatic and says, “Alliah is doing fantastic!” She has taken on other responsibilities, including assisting the training of new employees. Recently, Alliah has gotten a raise and is moving into a one bedroom apartment in a gated community. She is a super star and is looking forward to a bright and secure future. We are proud to announce that ICAN has yet another triumph. Samantha, an amazing and confident person, who has been suffering from Spina Bifida, is now working at a movie theater in Plantation selling tickets and as a customer service representative. Samantha walks with great difficulty but that does not keep her from working. She proudly announces, “I love my job. I feel good when I am asked questions and I can answer them even though I have only been here a few months.” What makes her success so worth celebrating is that Samantha overcomes her obstacles with such determination that its effects are contagious to others at her work. Although she is bound to a wheelchair for much of the time, but she told her mother, “Please put my wheelchair in the corner and only give it to me if I really need it.” Samantha is enjoying her success at her job and looking forward to other opportunities to conquer. This is another example of how your spirit can soar, despite setbacks in life.